To continue the work from yesterday with HRP-catalyzed luminol oxidation. Add 64.9 μL HRP stock, 3.31 mL luminol stock, and 6.63 mL buffer to stopped flow mixer. Add 5.00 mL hydrogen peroxide stock and 5.00 mL buffer to stopped flow mixer. Equilibrate mixer tubes with sample. Measure light produced as result of reaction, integrated over a specific time range. Integrate area under the curve. Add 245.13 μL HRP stock to a volumetric flask and dilute to 10 mL with buffer. Add 1.25 mL luminol stock to a volumetric flask and dilute to 10 mL with buffer. Add 2.00 mL of diluted HRP to stock and 10.00 mL of diluted luminol to stopped flow mixer. 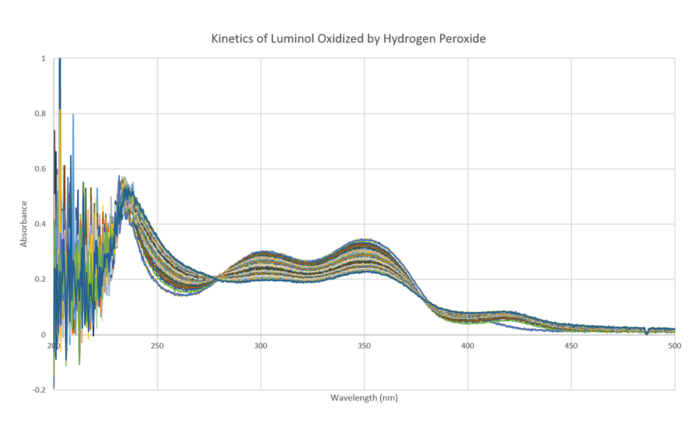 Using luminol and 3-aminophthalic acid spectra as endpoints, determine the kinetics of 3-aminophthalic acid synthesis. The stock solution of HRP was 0.77 μM. The stock solution of luminol was 1.51 mM. The buffer solution was 5.1 mM Tris at pH = 8. The stock solution of hydrogen peroxide was 12.8 mM.